Through a combination of work, pregnancy, and life in general, I was feeling pretty beat down in the first few weeks of November. I was exhausted, overwhelmed, and anxious – so much so that I started to worry that maybe second trimester wasn’t indeed any easier. If you’re unfamiliar with Astoria, Oregon, it’s a quaint little town perched on the northern most tip of the North Coast; and unlike some of it’s neighbors, Astoria is not much a beach destination, though you do get some wonderful views of the water (and if you’re looking some views of it’s wildlife – we saw harbor seals, sea lions, and a beautiful, peaceful heron!). 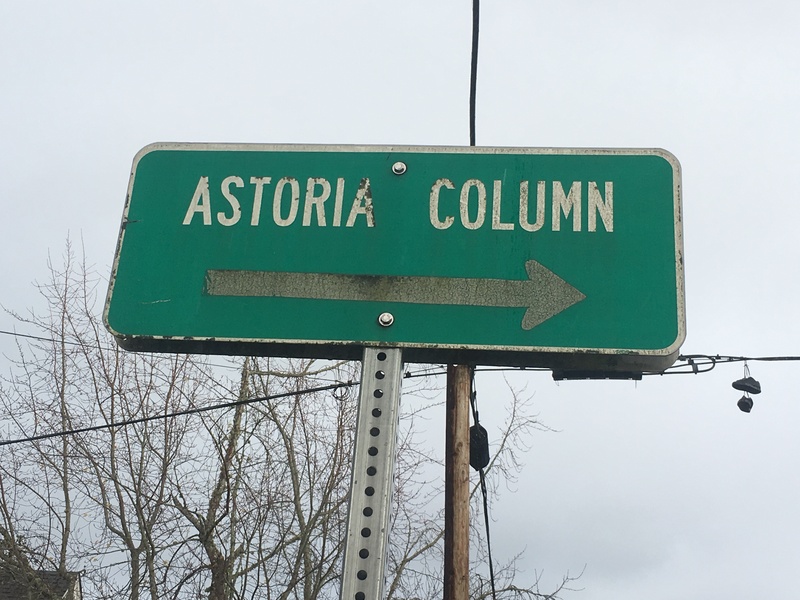 Even though it’s only a couple of hours from Portland, I hadn’t really spent much time in Astoria before, only driving through once when visiting the coast with my family in a very rushed and haphazard way. Needless to say, I was excited to explore what I found to be a funky little city, chock full of coffee shops, antique stores, good eats, breweries, and local flare. 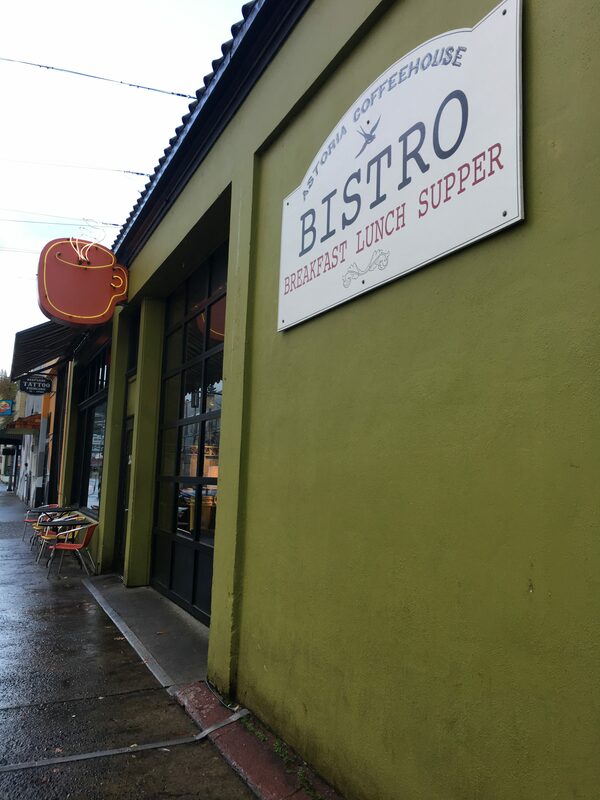 When visiting the Oregon Coast in the past, I often find it to be a little more difficult to find good vegetarian food…such is not the case in Astoria. On our first night, in the pouring rain, we retreated to a nice dinner at Carruthers right smack dab in the middle of downtown Astoria. It has a hip, chic vibe – high ceilings, art, and very clean lines. Given we walked in looking like a pair of drowned rats, we opted for the bar seating over the fancier looking dining room area. The u-shaped bar is a great place to sit – and if I weren’t pregnant, somewhere I would want to linger and drink cocktails late into the evening. The food is interesting, and beautifully presented. 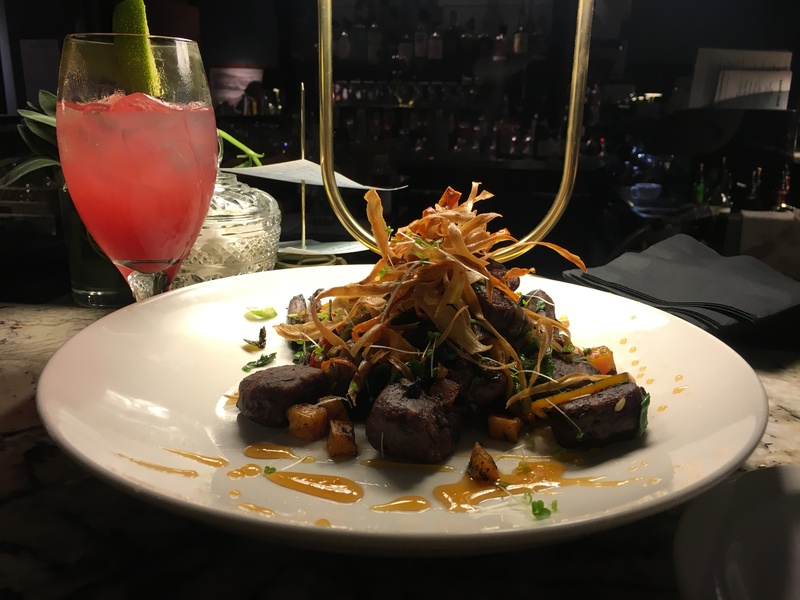 I ordered the Purple Potato Gnocchi which came with these delicious little crispy carrots on top and was surrounded by veggies and honey…oh, and of course a mocktail (courtesy and creation of the wonderful bartender). 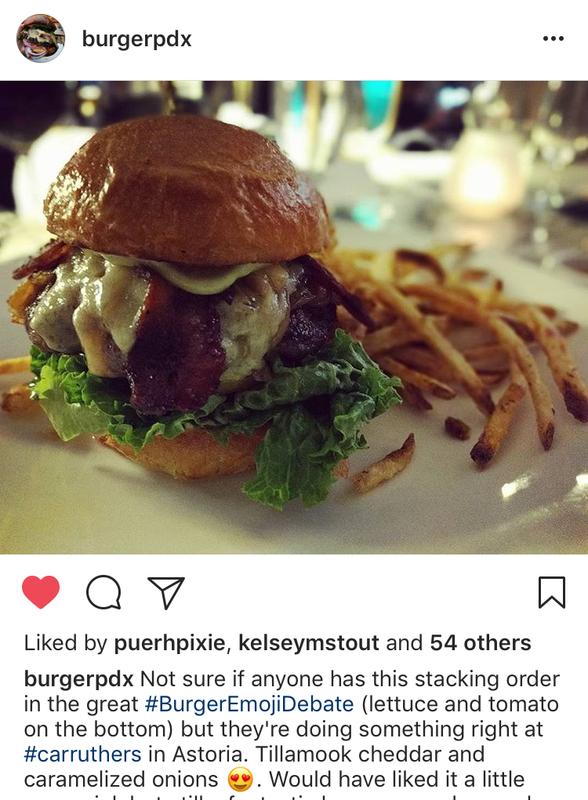 My husband ordered the burger – which he gave two thumbs up. The next day, we ventured a few blocks from our hotel to the Astoria Coffeehouse and Bistro for a light breakfast and coffee before yoga. 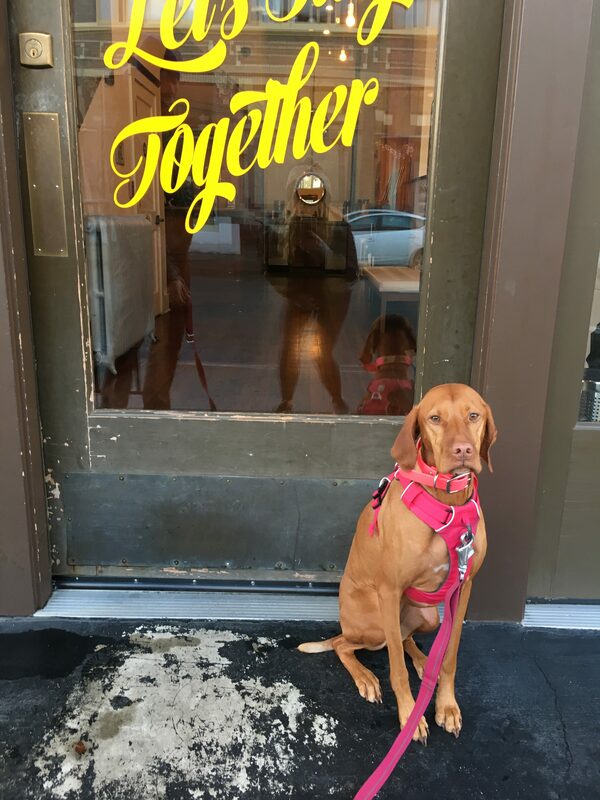 I absolutely love this space – it’s funky, eclectic and by the looks of things, it’s a favorite spot for visitors and locals alike. I had a delicious cappuccino and the yogurt parfait, which was admittedly just OK…too much honeydew for my taste. 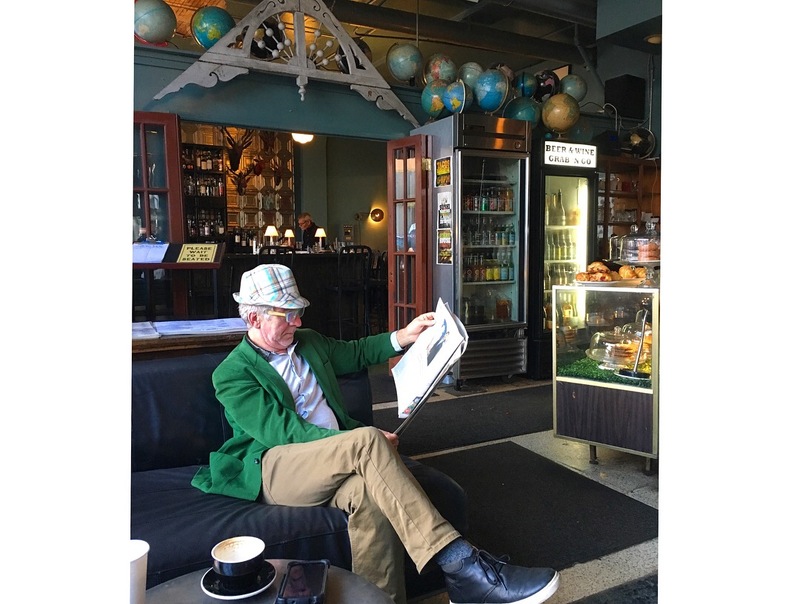 For lunch, we stopped in at Street 14 Cafe which was conveniently situated adjacent to our hotel – The Commodore Hotel. They have couches in the little lobby area between the restaurant and the hotel which made a perfect place to enjoy our lunch with our dog at our feet. 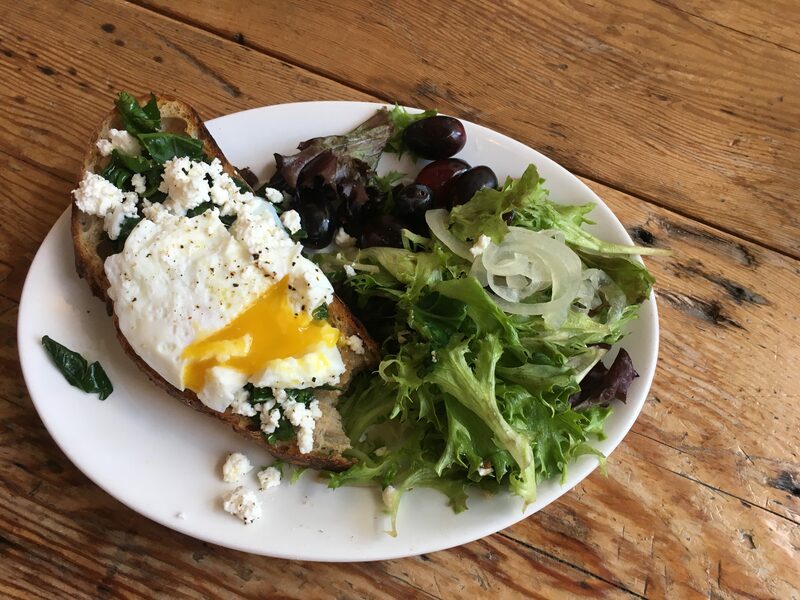 We both ordered the vegetable tartine…because ricotta and poached egg, y’all. 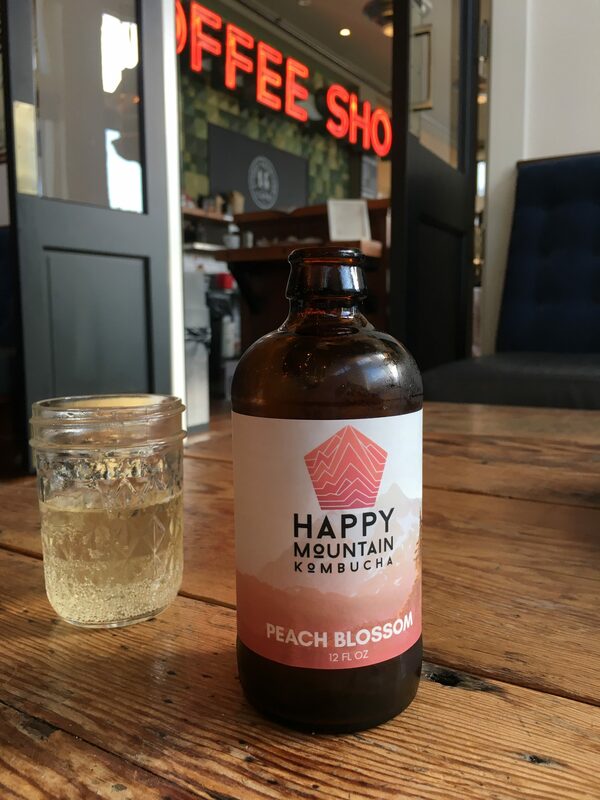 I also had the Peach Kombucha and OMG. That evening, we were absolutely starving. We had a long day of walking, hiking, working, and playing and needed to fuel up. After scouring menus and receiving many recommendations from friends, we ended up back at the Astoria Coffeehouse and Bistro for dinner. And I’m so glad we did. We sat at the bar next to some locals who gave us a ringing endorsement of the food, and had a delicious meal. I ordered tacos (shocker, I know) – which they made with tempeh for me instead of fish – and my husband ordered the meatloaf sandwich which I pointed out to him was not much different than a burger. We both left feeling full and happy. Our very last, and perhaps most special meal in Astoria was our breakfast on Saturday morning. 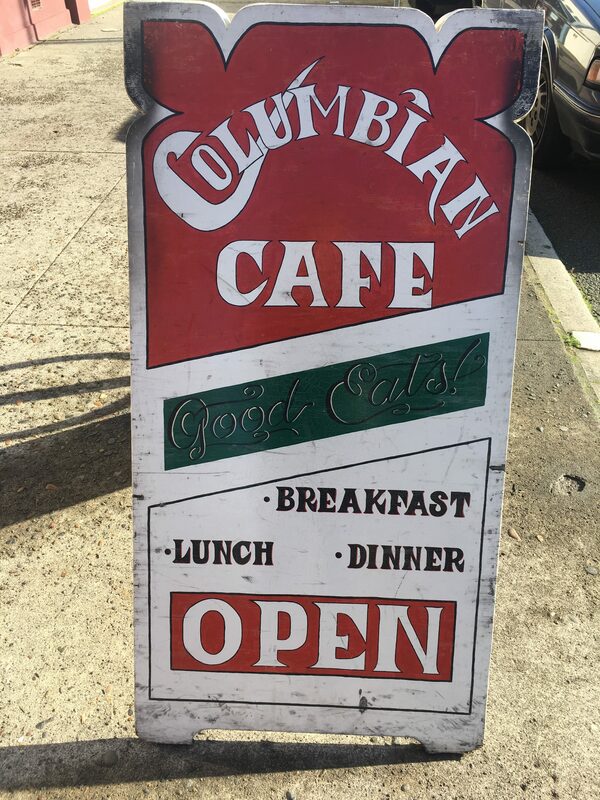 After reading countless glowing Yelp reviews, we knew we needed to stop in for brunch at the Columbian Cafe, adjacent to the Columbian Theater. It’s a one burner, one chef, funky little hole in the wall breakfast spot. 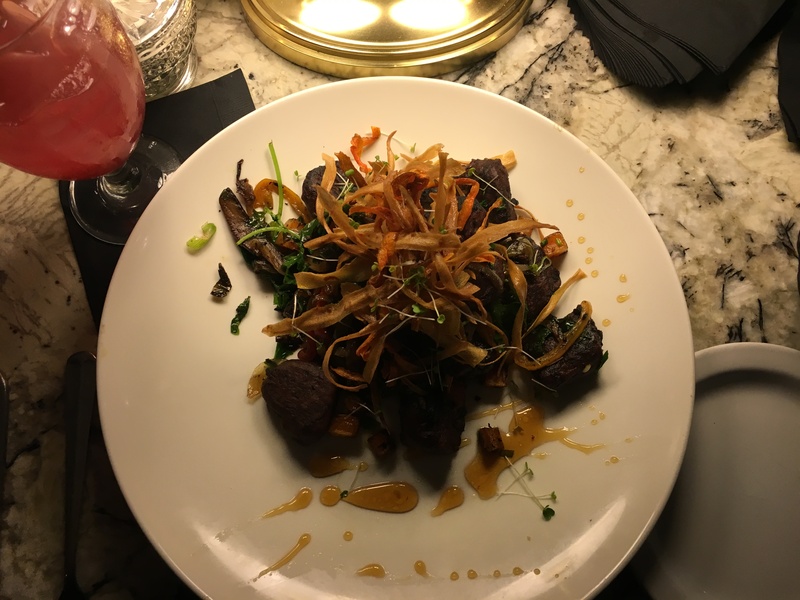 We sat at the bar in between two locals – both of whom struck up a conversation – and learned that their favorite item on the menu was the chorizo scramble which of course my husband promptly ordered. 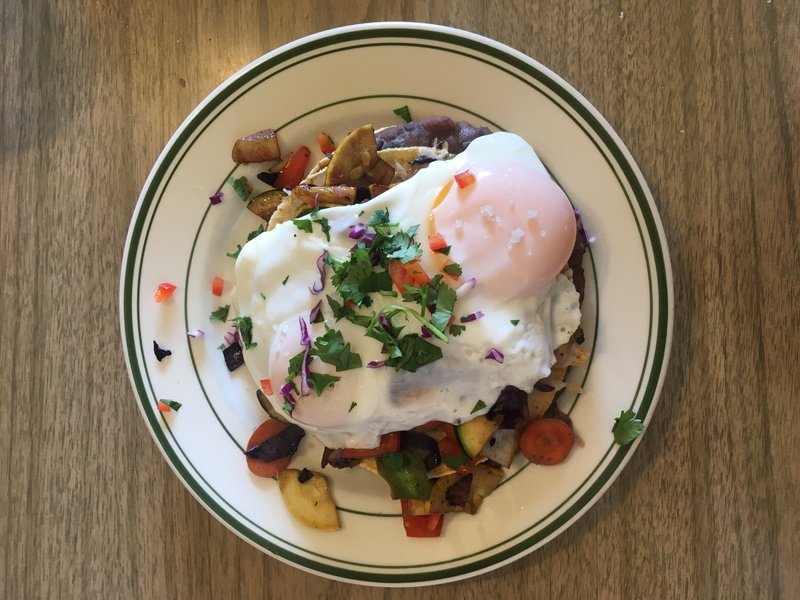 I went for the Tower of Power instead – a veggie friendly option – with beans (yessss), veggies, tortillas, and eggs. 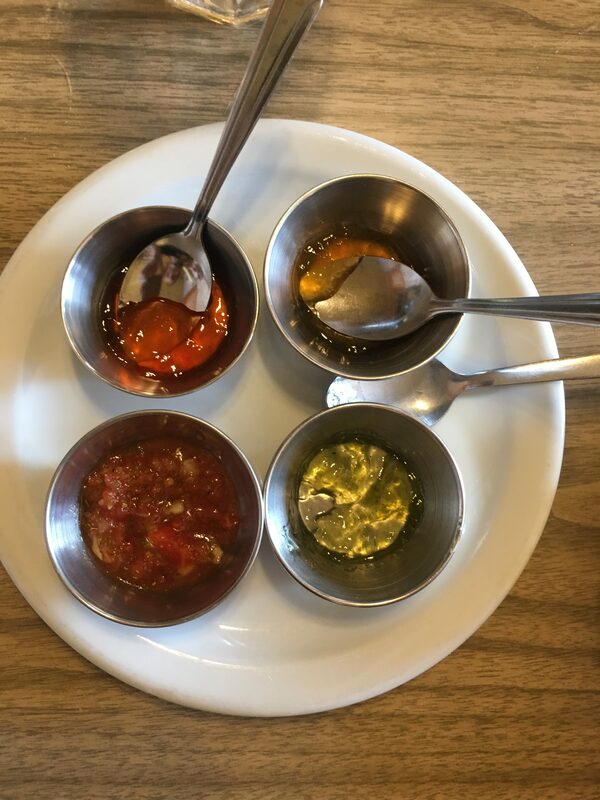 They also served us complementary HOMEMADE bread and jams – garlic, jalapeno, and cayenne – which were all so amazing. This place is definitely magical. 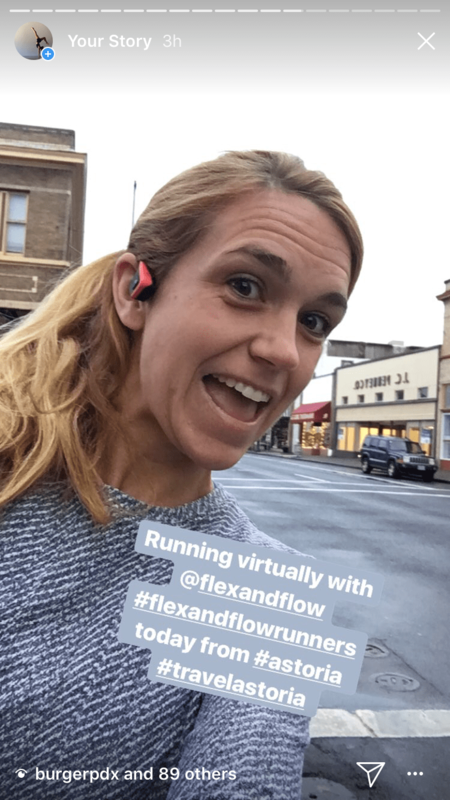 What I loved most about Astoria was that there’s a lot of exploring to be done – between all of the beautiful historical homes, trails, and views of the water, you really can’t go wrong. 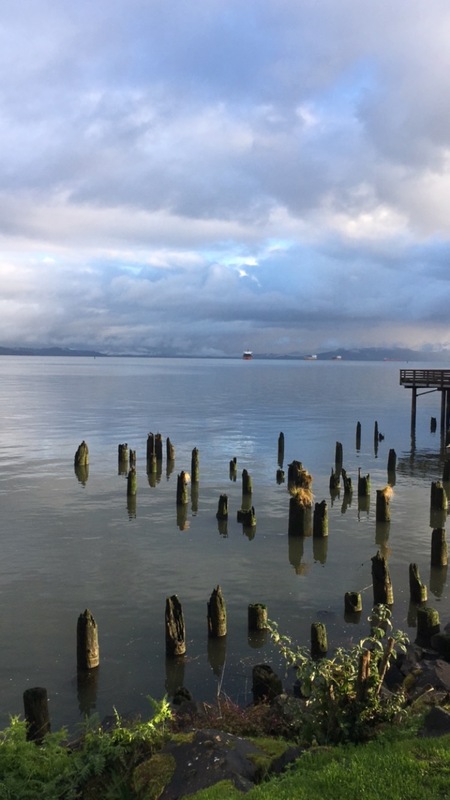 On my first morning, I spent some time enjoying the beautiful Astoria riverwalk – which stretches for roughly 6.5 miles along the Columbia from the Maritime Museum. 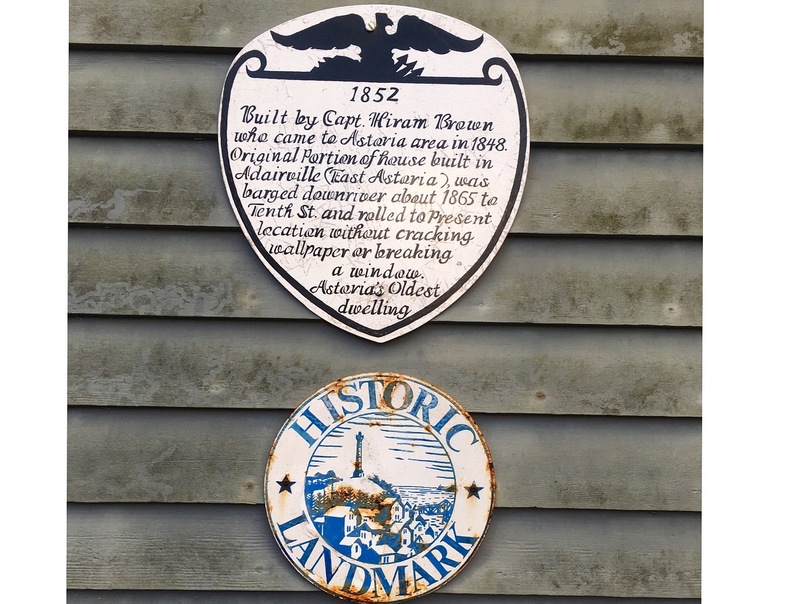 There are shops and restaurants along the way, as well as interesting industrial leftovers from former cannery days, and views of the giant Astoria-Megler bridge. 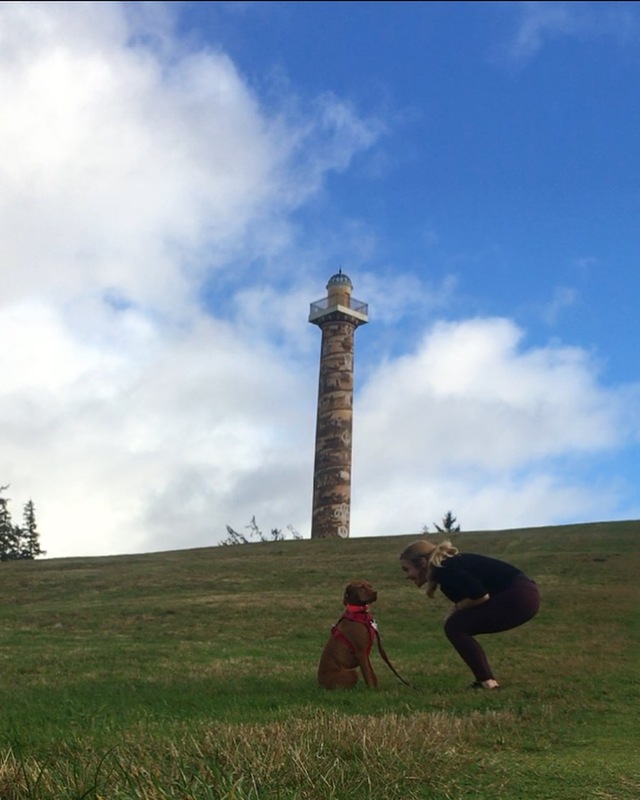 What I truly love most about visiting the Astoria Column is the steep, windy walk from downtown to get there. If you want some good exercise, climb all the hills, and then grab some great views from the top. 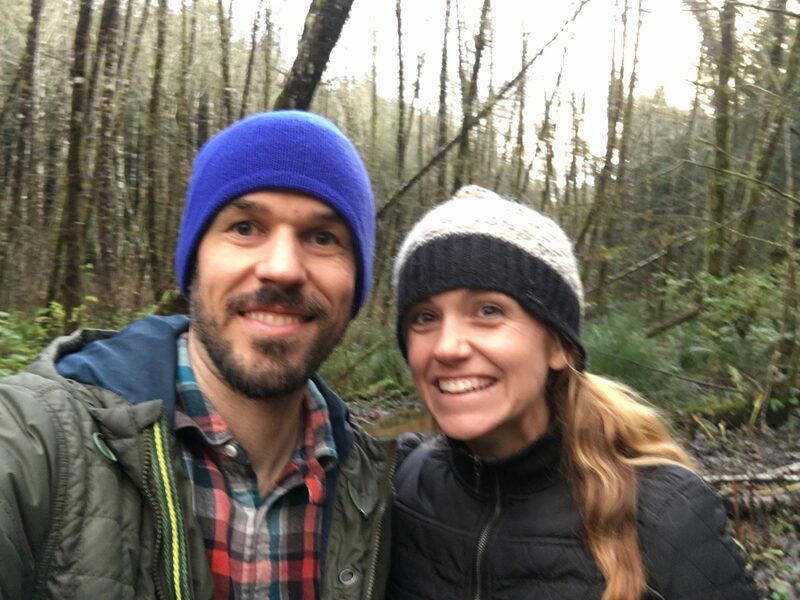 One of the highlights of our trip was our beautiful evening hike on the trails surrounding Fort Clatsop. It’s one of the only (or maybe THE ONLY) dog-friendly national parks which is awesome if you’re like me and always travel with your dog. We went pretty late in the day so we didn’t quite have time for a long hike – but we managed to do a 3 mile loop – and made it back just before sunset. 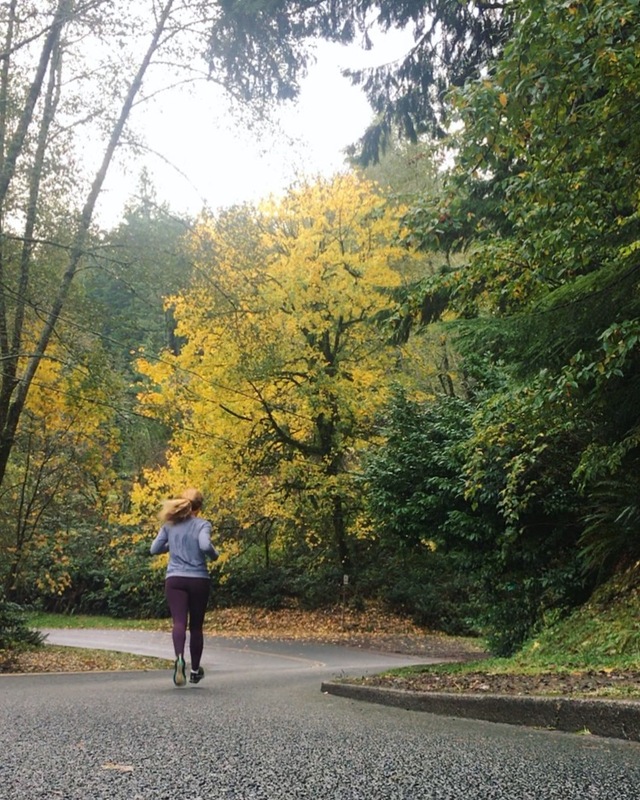 I’d love to come back and run on these beautiful, magical trails! For me, a trip just wouldn’t complete without a little sweat! And sweat I did. 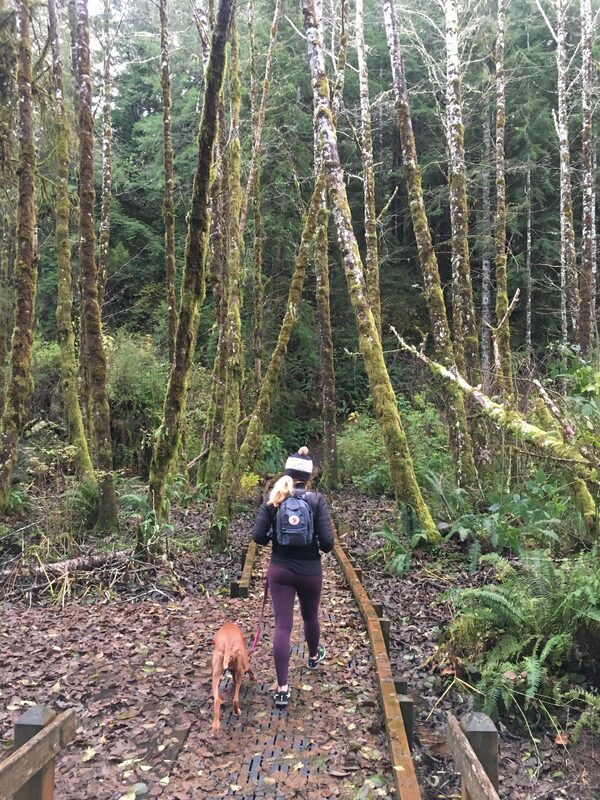 If you want to sweat in Astoria, go out and explore the trails, climb all the hills right in town, or pop in for some yoga at Riverszen. 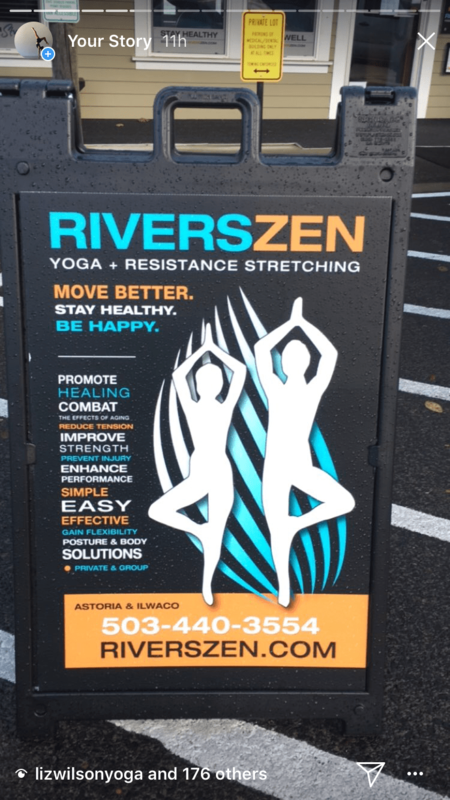 I can’t say enough good things about the Riverszen Yoga community; the minute you walk into this space, you feel like you belong. 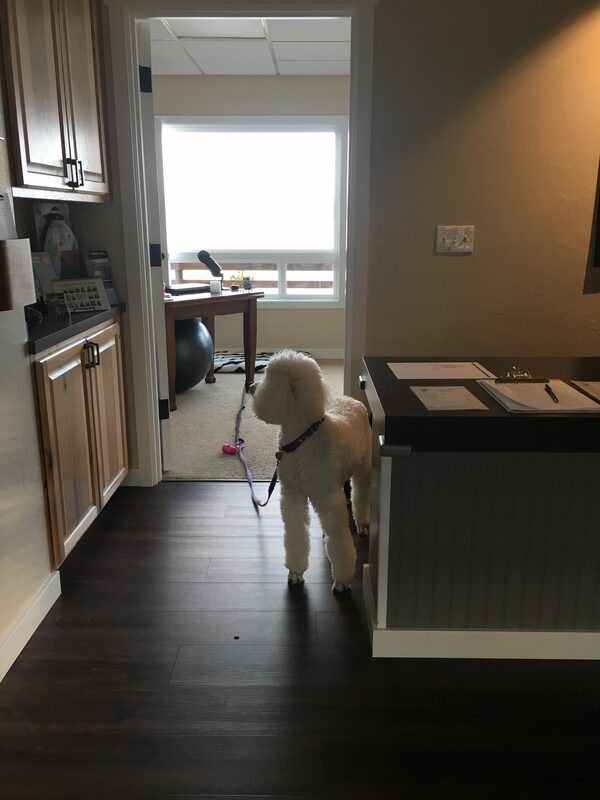 The owner Peggy is amazing and friendly – and she has an adorable studio pup, Pink the Poodle, who I just adore! 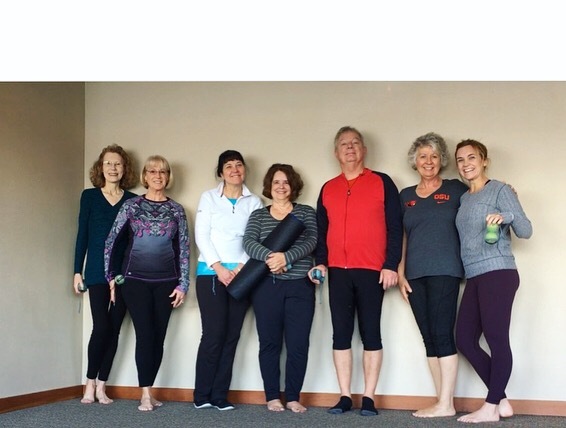 I went in for a Yoga Tuneup class on Friday morning with Wendy, which was exactly what I needed to ease my sore, body (thanks to a sweaty HIIT & Flow class the day before). 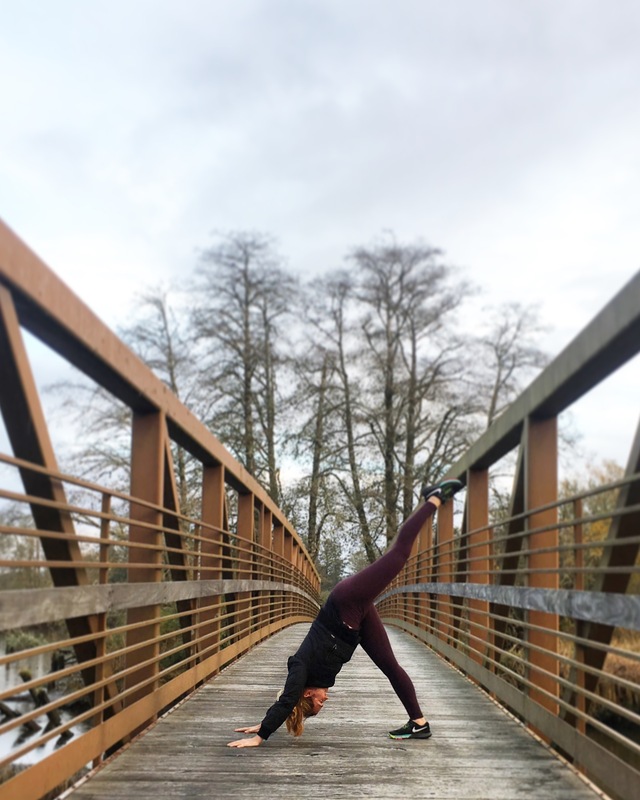 It was myofascial release combined with mobility work, strength exercises, and of course some good yoga stretching. 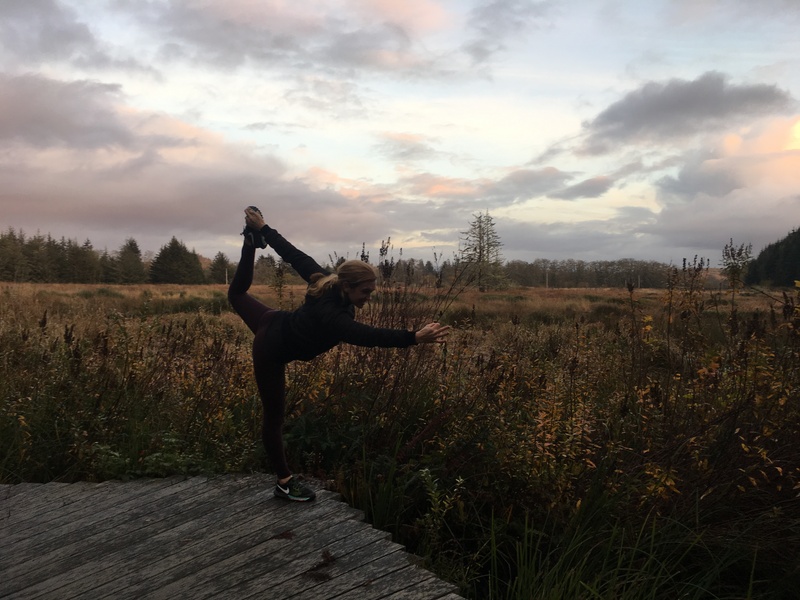 It not only felt amazing to move, it also felt amazing to be among such a kind and welcoming community (made me feel like I wasn’t too far from my Flex & Flow home!). 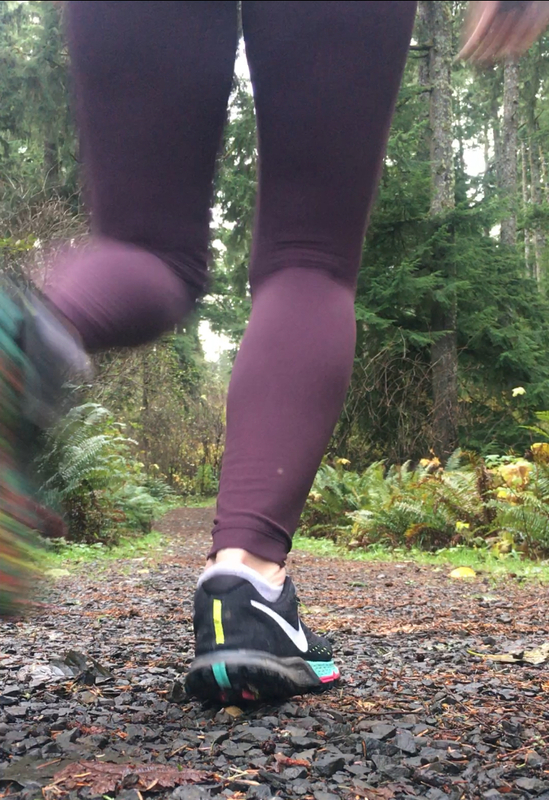 I found so many amazing opportunities to run in Astoria – from the trails surrounding Fort Clatsop, the the riverwalk area, downtown (all the HILLS! 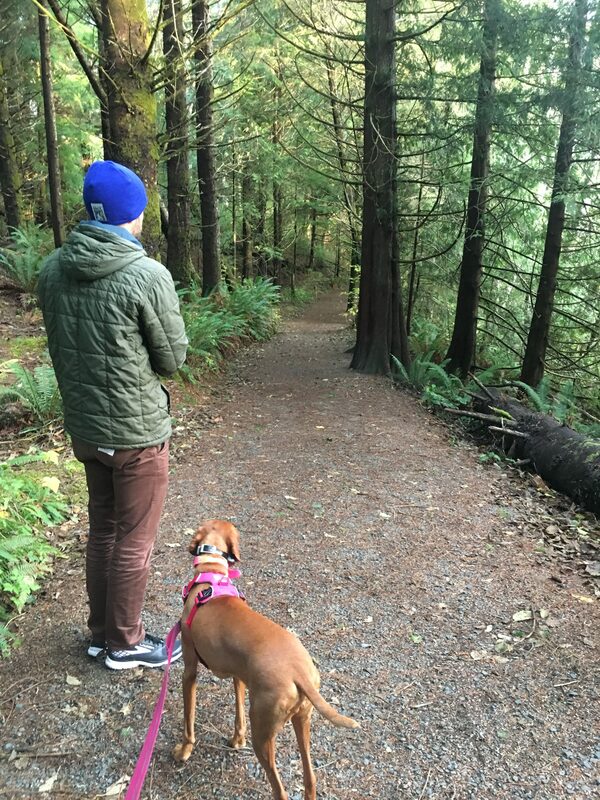 ), and of course the trails (and winding road) near the Astoria column. 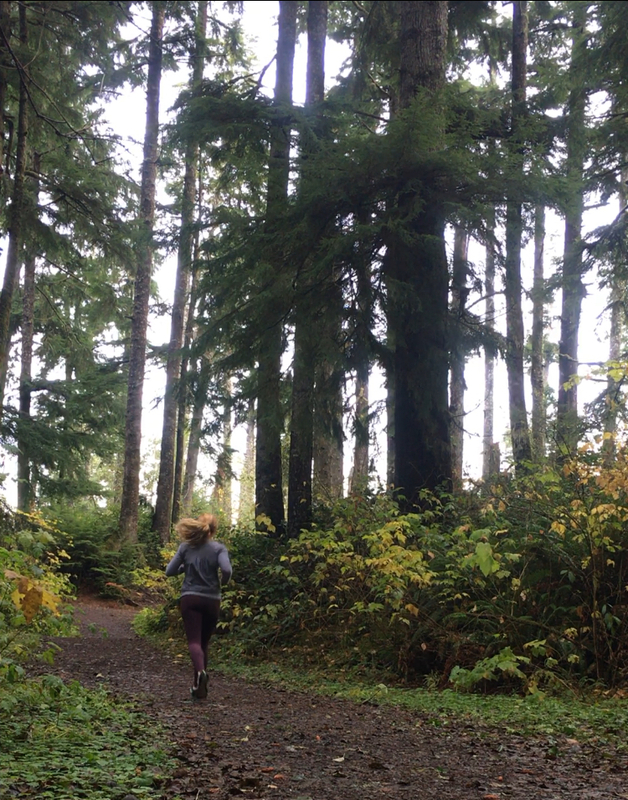 I spent my last morning exploring Astoria on foot and ventured up the steep hills, onto some windy roads, and eventually some beautiful trails. 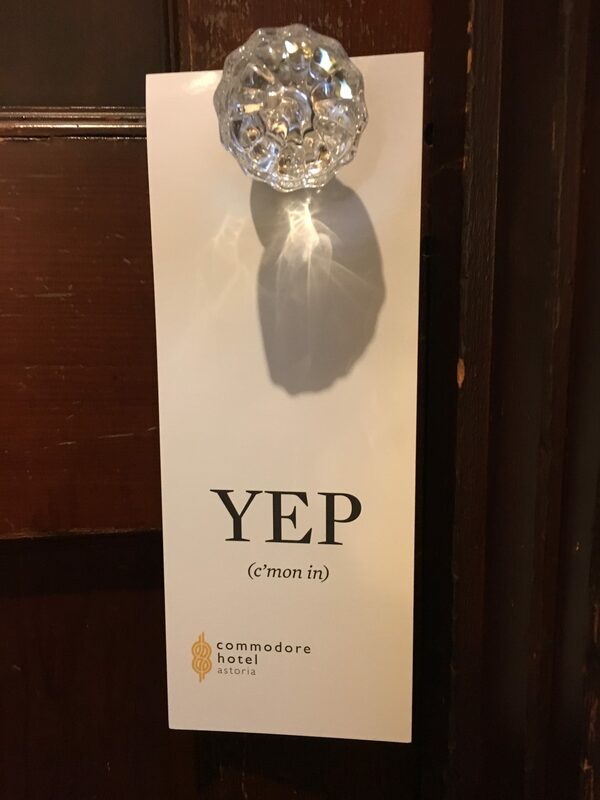 We stayed in The Commodore Hotel right in town and absolutely loved it. The location is absolutely perfect and the hotel is so cute. 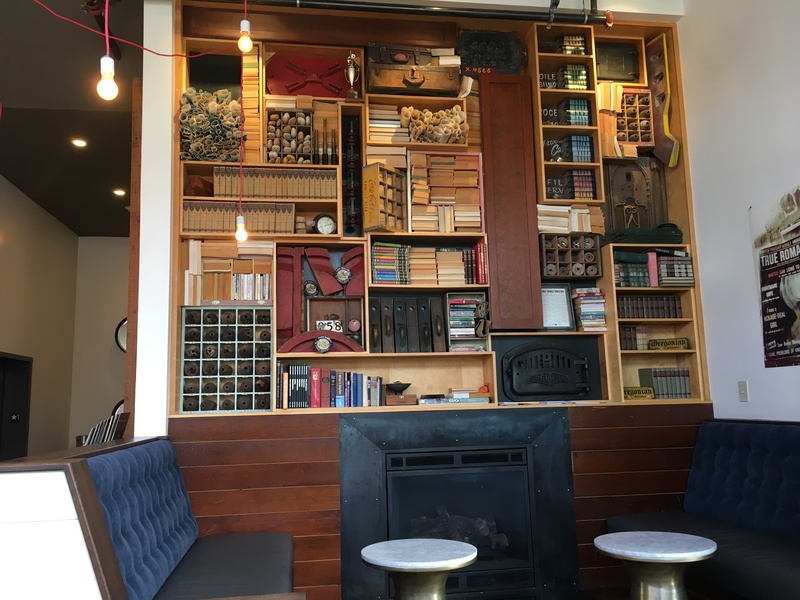 The lobby is so warm and welcoming – with couches and a full library of books – plus, its adjacent to 14th Street Cafe! 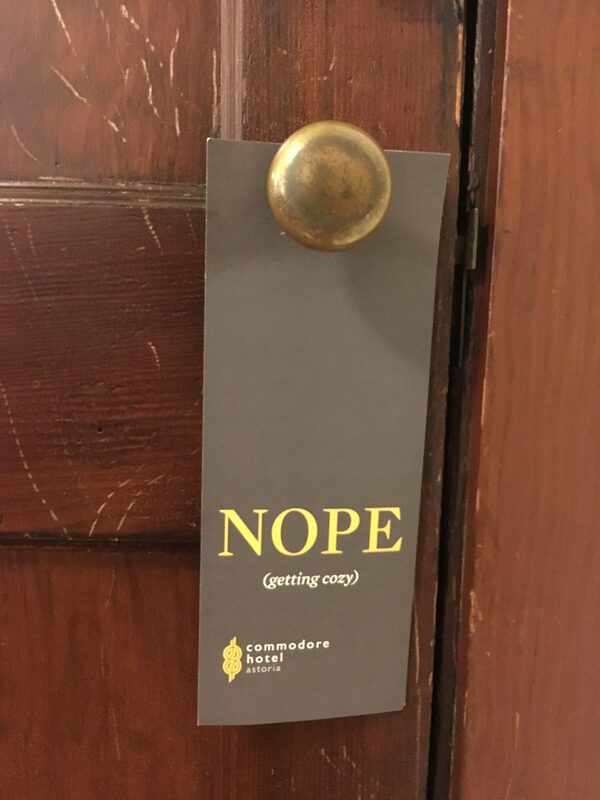 The rooms are cute and perfect for a little weekend getaway; the “do not disturb” signs are everything. That about sums up our trip – we ate, we played, we sweat – and we loved it! 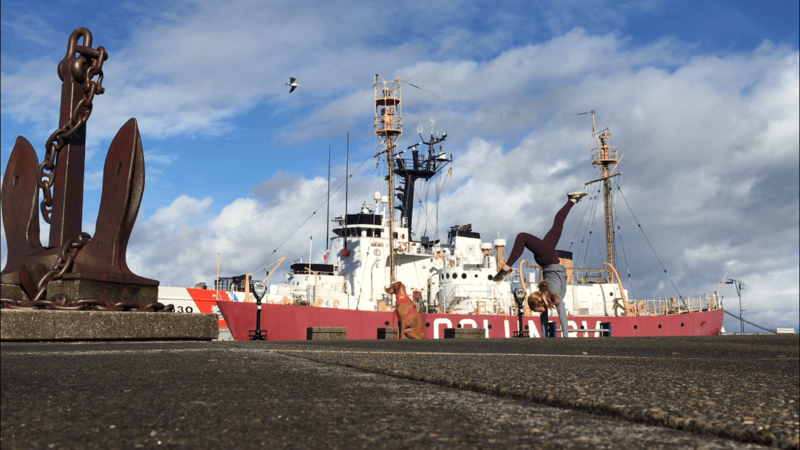 Whether you’re an Oregonian or visiting from elsewhere, if you’re looking for a fun Oregon adventure or getaway, definitely check out Astoria. For more great travel tips, check out travelastoria.com. Happy, safe travels to everyone on this Thanksgiving holiday week! Disclaimer: This trip was sponsored by the Astoria-Warrenton Area Chamber of Commerce. That being said, all of the opinions expressed, cute dog photos, experiences, and words are my very own. It was such a perfect little getaway! 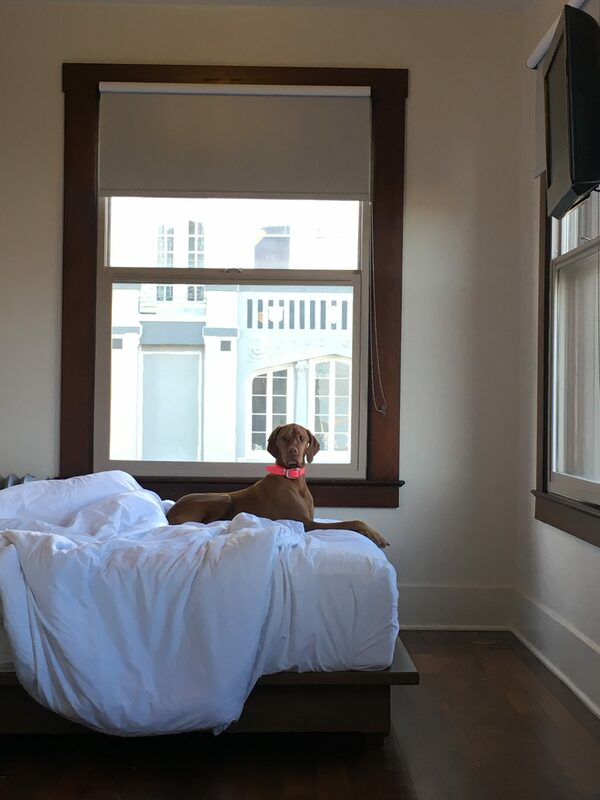 Abbie loved her little escape! This looks like the most fun trip! All that food looks delicious and I have to have it now. That trail looks so amazing and relaxing too! It was the most perfect getaway! Haha me too, legit want a poached egg right now. So fun! We have stopped for coffee a few times in Astoria on our way to cannon beach. But now I’m thinking a getaway may be in order! You would love it, such a cute little place to explore, eat, and reset! Astoria is my favorite place to getaway. We love Blue Scorcher for breakfast, Street 14 for coffee and usually hit up Fort George or Buoy for lunch/dinner. Our favorite spot to spend our time is the Columbia River Maritime Museum and then we like to take a ride on the trolley. We often head to Ecola for some hiking during our visit as well. Ah, I didn’t make it to Blue Scorcher but heard such great things. ON my list for next time!